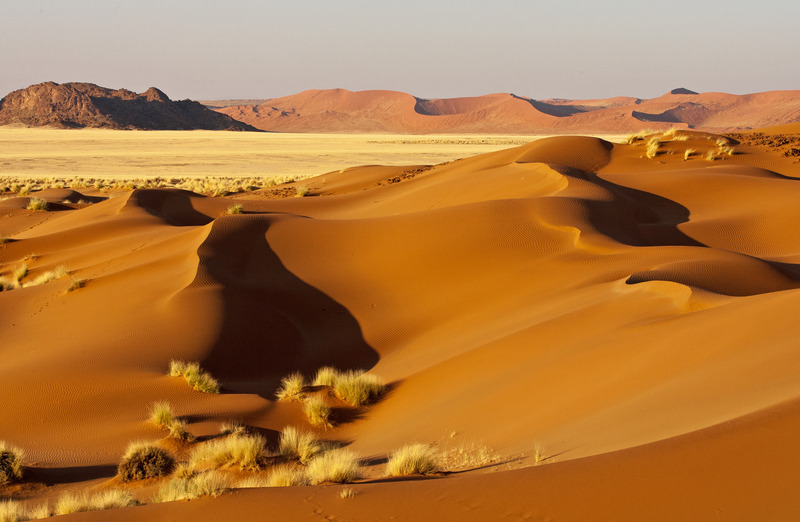 A 10 day exploration safari through the diverse landscapes of magnificent Namibia. 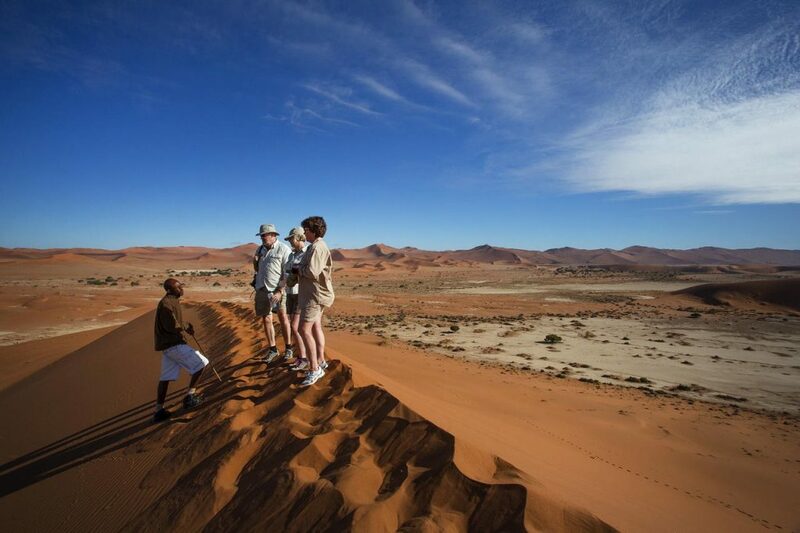 You will experience a true adventure, taking in the Sossusvlei dunes and the Namib Desert, the life-filled Atlantic Ocean, the ancient Damaraland plains, and Etosha’s famous wildlife. Stays in exclusive accommodation in private reserves and concessions enhance your trip, offering exciting opportunities for exploration. Throughout the tour there are unique activities, such as scenic walks and visits to the spectacular ancient rock engravings at Twyfelfontein. 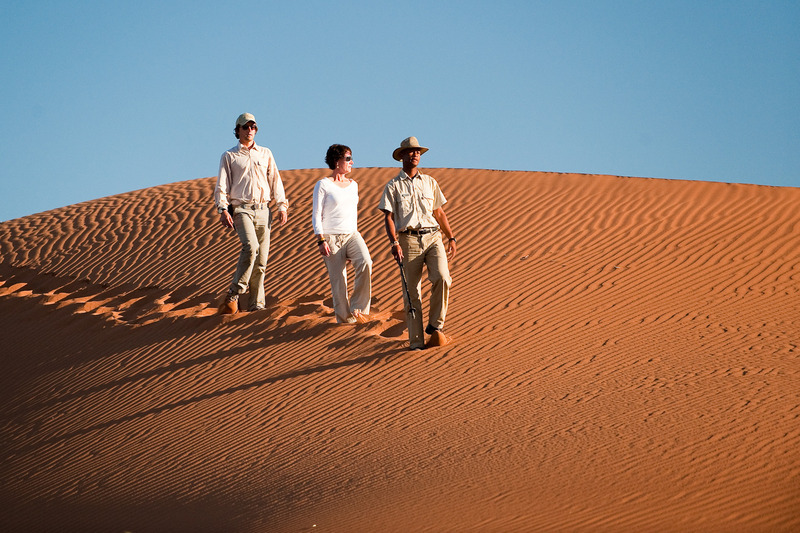 The Namibia Exploration safari is a true Namibian journey with an unbeatable range of activities! Your highly skilled, professionally qualified guide will meet you at Windhoek International Airport in Namibia. 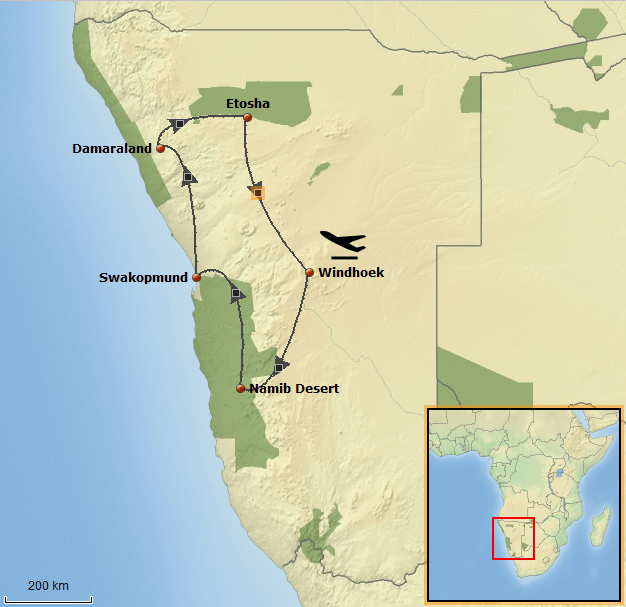 You will begin your journey by road (340km/271 miles) through the Khomas Hochland mountains and down into the iconic Sossusvlei region, and the private Kulala Wilderness Reserve and Kulala Adventurer Camp (approximately five hours driving time). 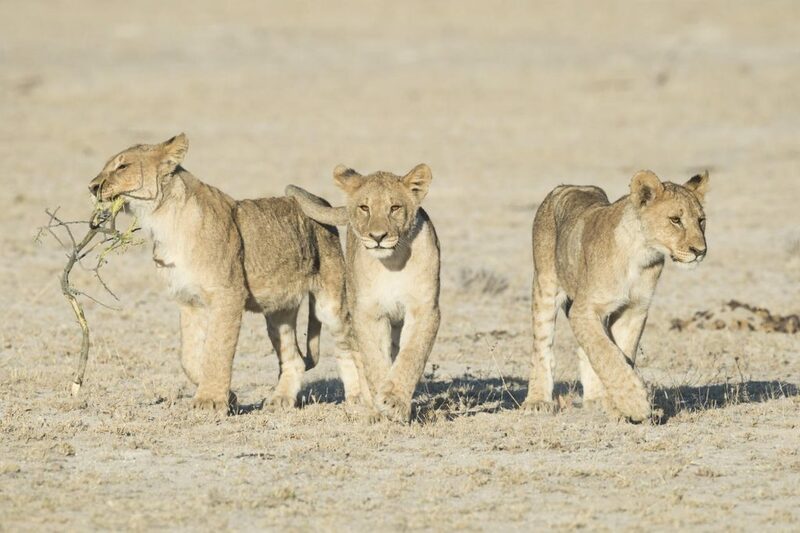 Here you will spend your time on day and night scenic drives and walks, observing desert wildlife such as ostrich, springbok and gemsbok, as well as smaller creatures like bat-eared fox, black-backed jackal and Cape fox. 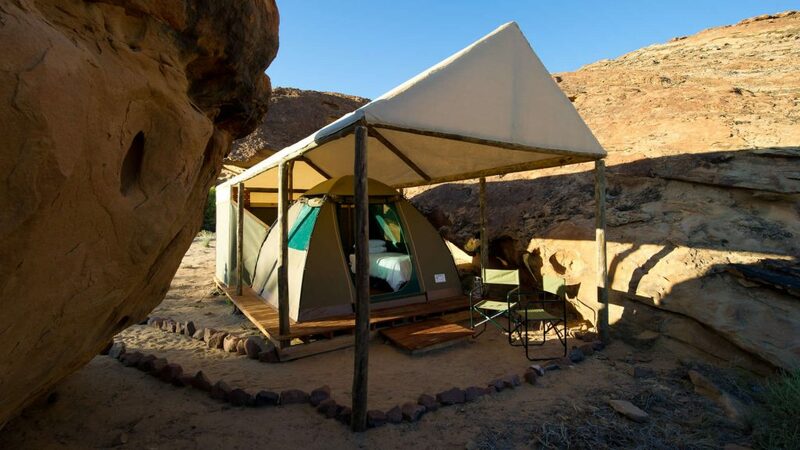 The camp comprises five shaded maxi dome tents, and is perfect for taking in the reserve’s vast vistas and stark splendor, with views into the Namib Naukluft National Park. 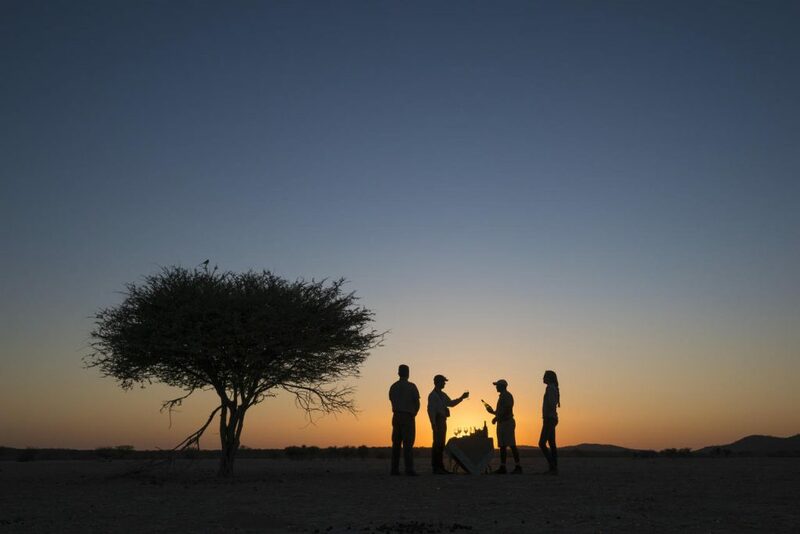 Dinner is served under the dazzling Namibian skies, and watching a deep red sunset to the chorus of barking geckos is an absolute highlight. Another is quietly idling at the soaring red dunes of Sossusvlei, famous for their magenta hues in the early morning sunlight. You will depart camp early and drive through the winding roads of the Kuiseh Canyon and onto vast gravel plains, arriving in first Walvis Bay before moving north to the quaint town of Swakopmund (370km/230 miles, or about a 5 – 6 drive). We will spend the rest of the day discovering Swakopmund and bed down in the luxurious Hansa Hotel, an iconic hotel that that forms an integral part of city’s architectural culture. The hotel offers 48 twin/double rooms, 6 family units and 3 luxury suites and an executive suite, each with an en-suite bathroom with separate bath and shower, tea and coffee facilities, bottled mineral water, a 15-channel television, under-floor heating, air-conditioning, a safe, bathrobes, a telephone and internet connection. A short walk will bring you to a heated Olympic-sized indoor public swimming pool, the Swakopmund museum, the town lighthouse and Kristall Galerie, as well as several good restaurants if you wish to try an alternative to the Hansa’s tasty fare. The next day we will set out on an exploration of the icy blue Atlantic coast, with a dolphin and seal catamaran cruise from Walvis Bay (weather permitting). The cruise takes in oyster platforms – including tasting the delicacies – before moving on to Pelican Point to see the lighthouse. In this area three species of dolphins may be encountered, namely the rare endemic Heaviside’s dolphin, and dusky and Atlantic bottlenose dolphins. Aside from spotting diverse pelagic (ocean-going) birds, pelicans, flamingos, and Cape fur seals, the massive sunfish, leatherback turtles, southern right and humpback whales can also be seen in season. This cruise is rounded off with a private seafood lunch, before returning to the hotel in the late afternoon. We continue our adventure by road 320km (200 miles), and approximately an 8 hour drive, to Damaraland, west of the Brandberg Mountain, stopping for lunch at Ugab Save the Rhino Trust Camp. This area boasts the largest concentration of black rhino anywhere on the planet outside a national park, and also has a varied assortment of desert-adapted wildlife, including desert elephant, and incredible geological formations. 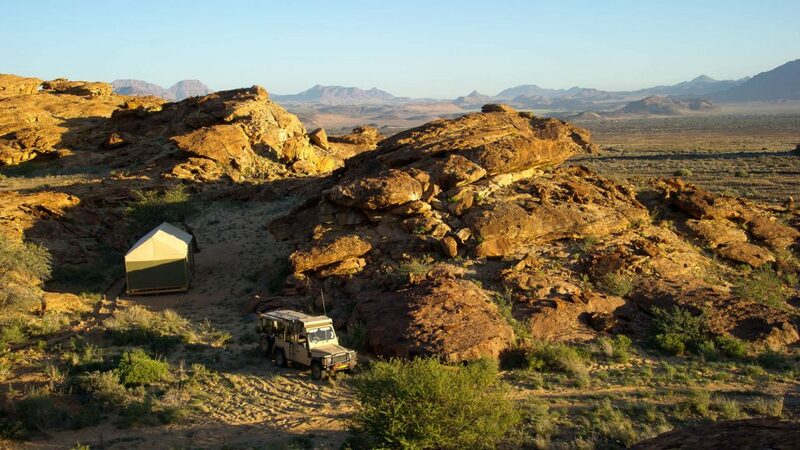 The Damaraland Adventurer Camp provides our base, and is located in the heart of the rocky desert of Damaraland, an ancient and majestic landscape. 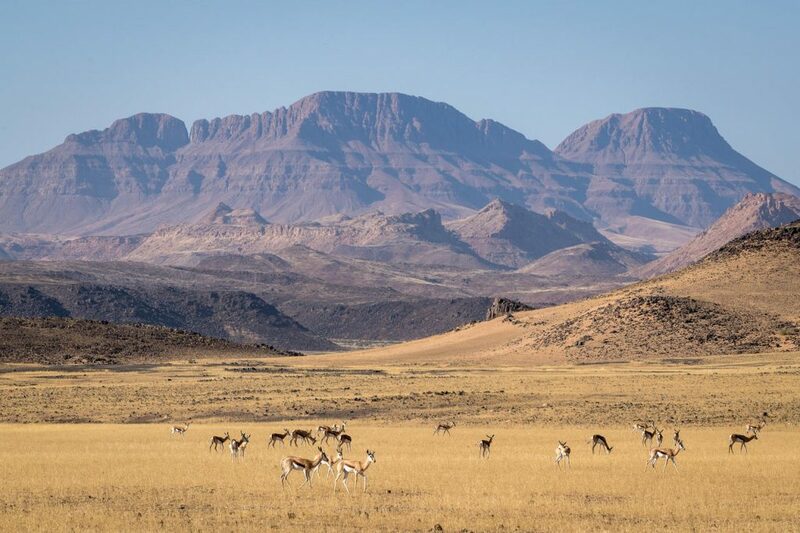 Looking south from camp toward the imposing Brandberg Mountain, Damaraland offers endless vistas and one of the most spectacular wilderness areas in Namibia. The icy Atlantic Ocean air meeting the warm desert air of the Skeleton Coast, and drifting inland along the river valley, forms atmospheric early morning mist. This mist feeds the flora and fauna of the region, hence the high density of wildlife in the area. 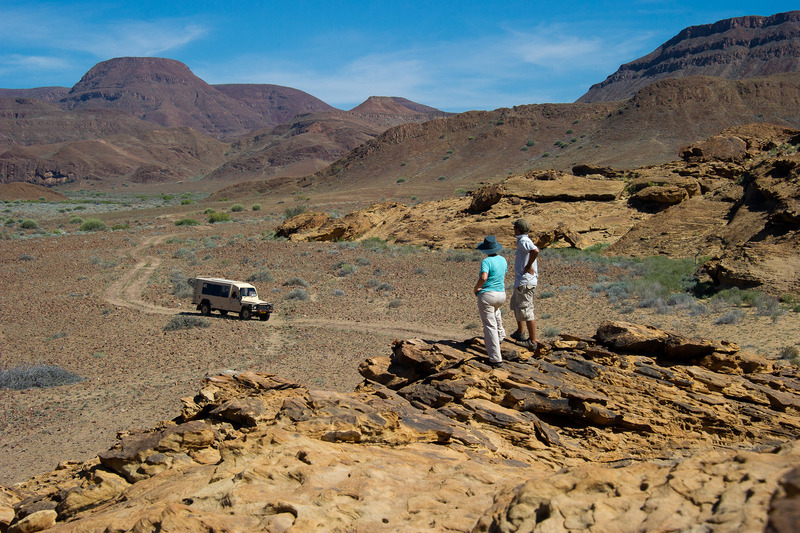 Our activities range from day and night nature walks, and viewing the rock engravings at Twyfelfontein (a World Heritage Site), to daytime nature drives, studying the mountains, hills and temporary riverbeds and springs in the area. 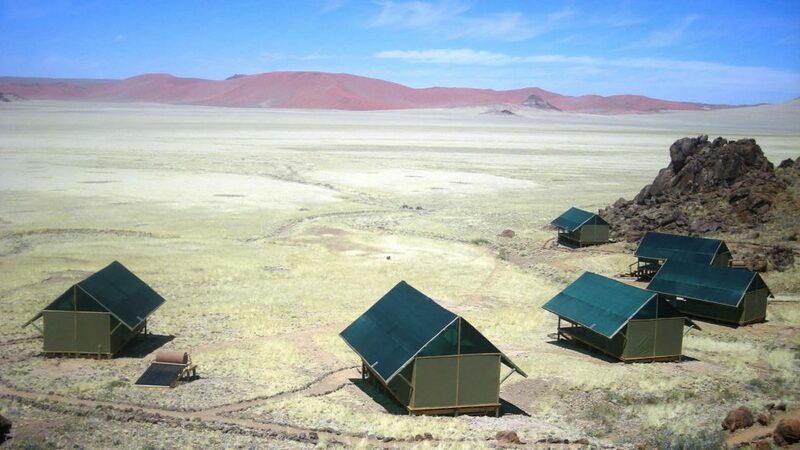 Accommodation is in 5 maxi dome tents pitched on timber platforms that allow for a small viewing deck where you can sit for hours and consider the surrounding beauty. Tucked away in and amongst the sandstone hills, each tent is spacious, with wooden beds with mattresses and cotton linen. En-suite bathrooms with toilet and shower are located at the back of each tent. 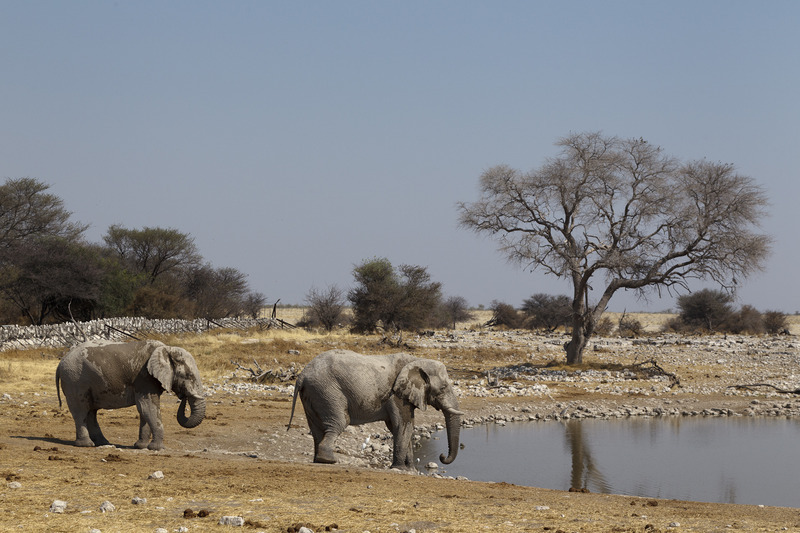 Leaving Damaraland we drive approximately 330km (205 miles and a 5-hour drive) to Ongava Game Reserve on the boundary of the world famous Etosha National Park, one of the highest density wildlife area within Namibia. 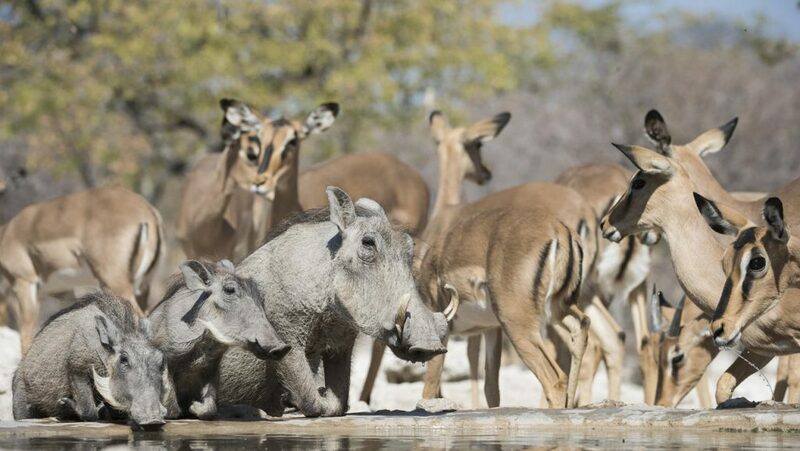 Ongava is home to one of the largest black and white rhino populations in Namibia thanks to a successful reintroduction programme, and birdlife in the region is spectacular with over 340 species recorded. During game drives in both reserves, we will be exposed to a wide range of wildlife including black-faced impala, with their predators, in particular lion, never too far away. Tucked away in the foothills of a dolomite hill, Ongava Tented Camp is one of Namibia’s best-kept secrets. 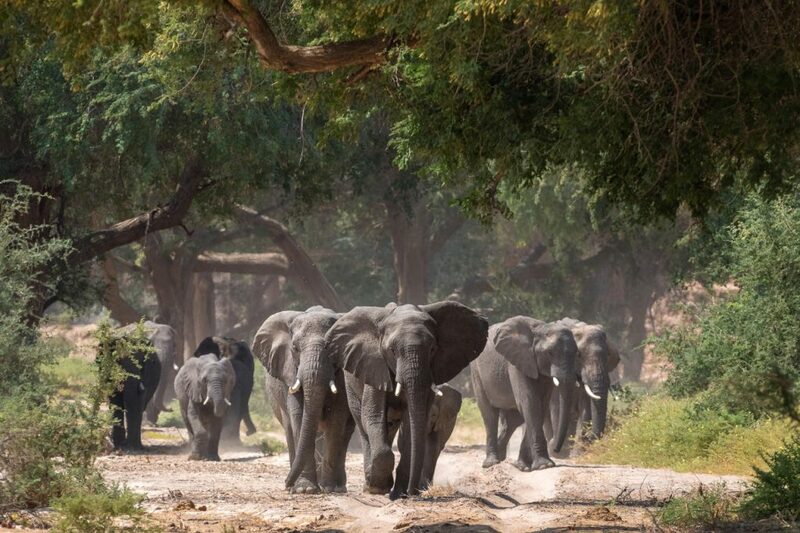 You will be captivated by the bustling waterhole in front of camp as wildlife file through to quench their much needed thirst. 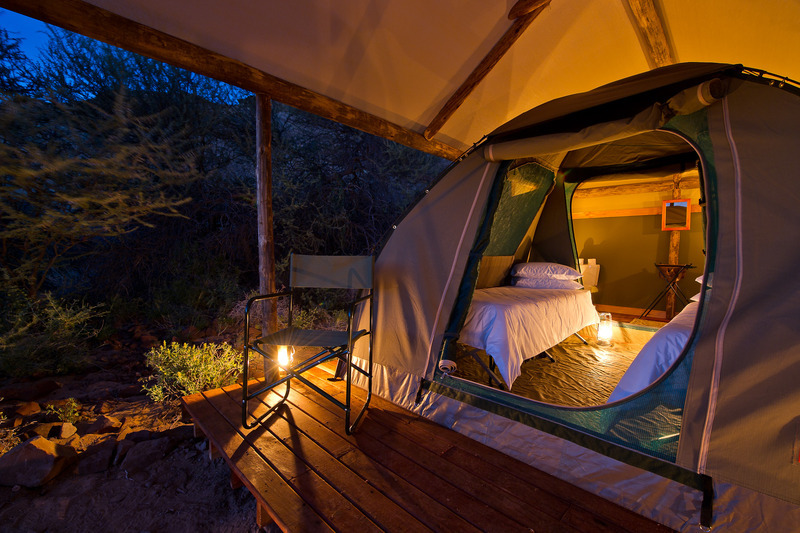 Your accommodation will be one of the eight delightfully rustic en-suite Meru-style tents, built on a raised wooden deck which stretches out over the wilderness. The stone, canvas and thatched main area, with its relaxed swimming pool completes this intimate camp. 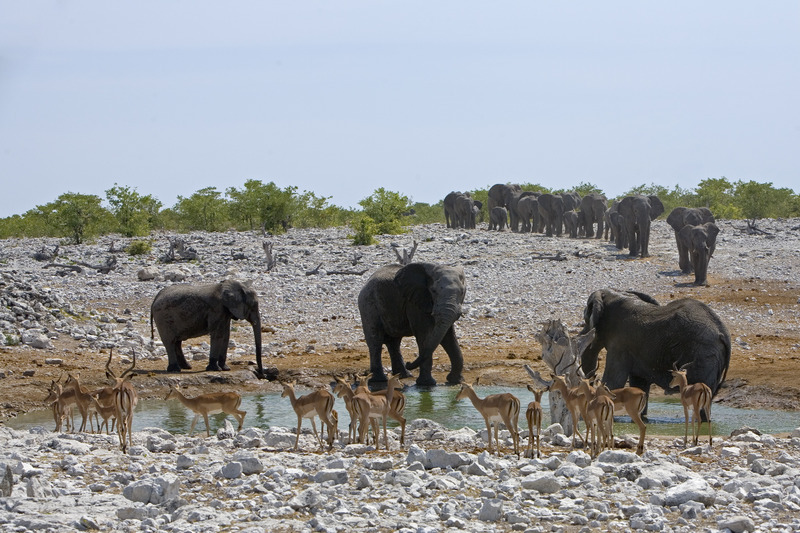 Bordering the iconic Etosha National Park and set within its own wilderness haven, you can expect unrivalled game viewing complimented by the tranquillity of a private reserve.e.